For me, Star Wars books are often like comfort food -- familiar, not overly surprising, but good, an enjoyable way to pass the time. So when I scheduled Paul Kemp for my interview chat, I was surprised to learn his Star Wars books didn't include those familiar characters I'd grown to love--the characters who made me fall in love with science fiction, made me want to tell stories. But Paul Kemp wrote a Star Wars book (three now in fact), and we're close in age, so I wanted to commiserate. He must have viewed the saga at the same age I did with similar awe. What was it like to now be a part of that universe as a storyteller? So I ordered up some reading copies and read. Imagine my surprise when I found myself engaged, even captivated by the characters. Kemp's ability to create immediate connections between characters and readers is admirable. He had me at "hello," you might say. And like a stalker, he never let me go, but in a good way. Even the antagonist, Darth Malgus is someone you can't help but feel sympathy for. He's relatable. He may be evil and dark and hateful, but he's human, just like the reader. And Kemp brings that out so well you almost root for him at times against the protagonists. That's great writing. I can't wait to chat with Paul and find out more about his writing journey, to soak up the lessons he has to teach us about writing, and to call him my friend. He tells me his assignment was to do a story with Darth Malgus, a character from the forthcoming online multi-player game "The Old Republic." He wrote a Malgus story with spades. 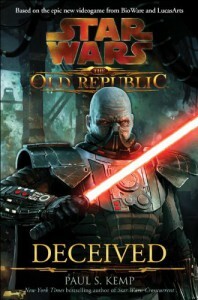 The book revolves around three central characters, the dark Sith Malgus, a rogue Jedi Aryn, and a pilot Zeerid. Malgus wants to conquer the universe for the Sith and rid them forever of the Jedi menace. Aryn wants revenge for the death of her mentor/father-figure at Malgus' hands. Zeerid, an old friend of Aryn's, is just trying to pay off a debt and provide artificial legs for his young daughter. Each of them gets sucked in by circumstance to a web of deception--both internal and external to themselves--and struggles to accomplish their goal. All of them wind up taking paths far different than they'd imagined in doing so. And all of them learn lessons that forever change them in the process. Filled with action and moving at a steady clip, "Deceived" even includes a cute astromech droid character, who may remind us of ancestors to come. It has romance, betrayal, political intrigue, and rivalry. It's a well told tale that could be set in any universe but works exceedingly well in the confines of the familiar Star Wars one. Truly these are characters worth discovering and enjoying. I'd like to see more of each of them. I can't wait to read more from Kemp. Highly recommended.